American broadcast journalist Edward R. Murrow spoke those words for the first time at the end of one of his segments in 1940. It became one of his catchphrases, as well as the title of the 2005 Oscar-nominated film about his conflict with Wisconsin U.S. Senator Joseph McCarthy. 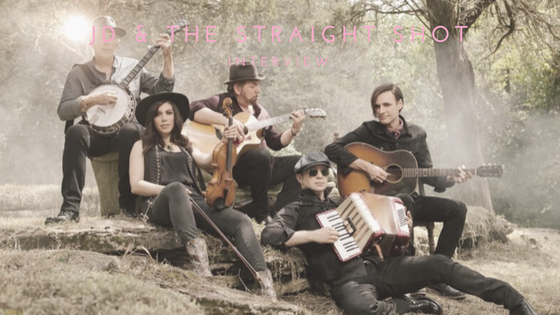 With the amount of chaos in today’s world, from politics to the environment, New York Americana band JD & the Straight Shot felt the phrase was a fitting title for their sixth studio album. By switching the phrase for the album, Good Luck and Good Night plays off of the backwards ideology of today's news cycle. Slaver was enrolled in a music program for the violin at just three years old and trained classically from childhood through college. She also grew up playing music with her father, where she was brought up hearing country, bluegrass and jazz influencers. At just 29 years old, she’s worked alongside Martina McBride, Rod Stewart, Rascal Flatts and more. Her first rehearsal with JD & the Straight Shot had her beyond nervous as she stepped into the illustrious studio A of Avatar Studios. Waiting in that room for her was Zev Katz on bass, Shawn Pelton on drums and Brian Mitchell on keys. However, the intimidation element immediately dissolved as their talents complemented one another inside of that studio. Today's lineup of Slaver, Pelton, lead guitarist Marc Copely, bassist Byron House, and JD himself - Jim Dolan - is another piece of Slaver's resume that shines brightly. Good Luck and Good Night is a blend of each member’s varied background in an entirely acoustic format. It has fusions of classical and Irish folk music with touches of rock and roll, country and blues. Even forms of literature make their way into certain tracks, from Charles Dickens to Maya Angelou. Murrow’s “good night and good luck” was adopted from a live radio address given by then-Princess Elizabeth II. Londoners often closed their conversations with the phrase due to the nightly German bombing raids. Now more than ever, the phrase once again applies to the world’s turmoil. An Americana band from New York has decided to revive that phrase. This is JD & the Straight Shot.